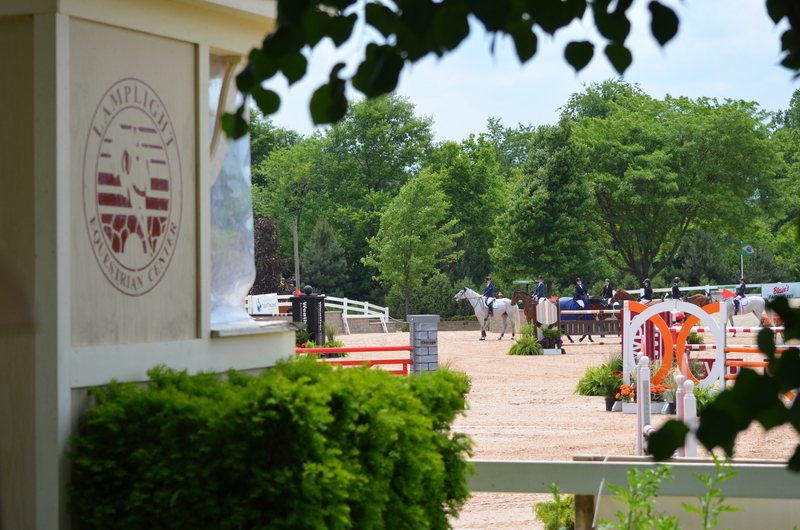 Wayne, IL – July 30, 2014 – The feature class at Lamplight Equestrian Center’s Equifest II today was the $5,000 1.40m Welcome class in the newly remodeled Grand Prix ring. Fourteen entries vied for the prize over the Manuel Esparza designed course. Esparza of Mexico City, Mexico, was the Assistant Designer for the Olympic Games from 1996-2008. His time allowed on today’s track was comfortable and the toughest two spots seemed to be a wide oxer off a short turn by the in-gate and the triple combination. Only three managed to put in a clear round to proceed to the jump off. Two of those were Lisa Goldman’s of Hawthorn Woods, IL. Centurion B proved to be the fastest by fractions of a second with 40.523. Goldman’s second mount, Morocco, was right behind with 40.844 and Liz Atkins, Hampshire, IL, with NIro 8, caught a rail and a time of 43.657. 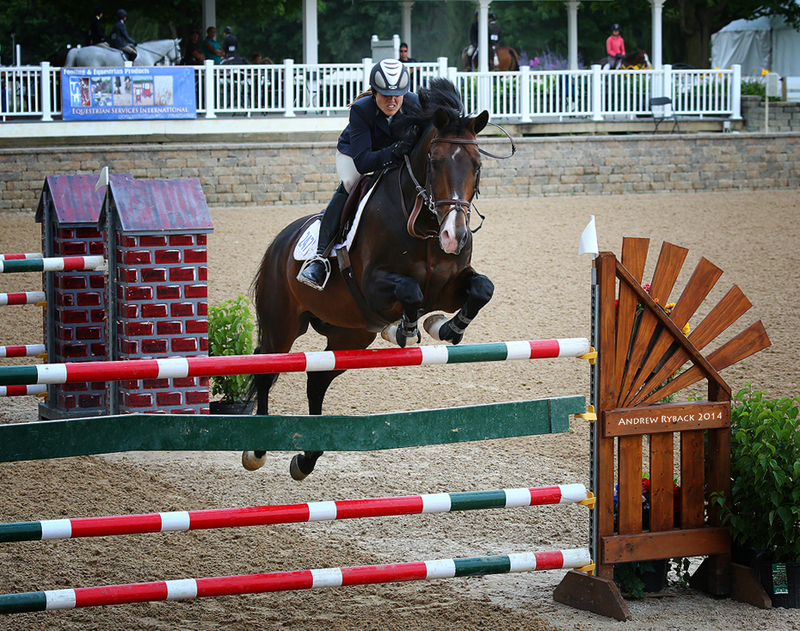 Liz Atkins and Niro 8 were the only other pair to make the jump off with Goldman. Photo Andrew Ryback. Atkins and Niro 8, a thirteen year old Trakehner stallion, finished third in the $35,000 Prix de Lamplight last week at Equifest I.
Goldman was at Traverse City last week and came to Equifest with two big wins under her belt, the $2,500 1.40m Open Speed Class for Centurion B and the $10,000 Welcome Prix with Morocco. Goldman was first on Centurion B, a twelve year old Belgian Warmblood, and quickly set the pace in her usual fashion with a clean, fast time. Lisa Goldman and Morocco placed second by fractions of a second. Photo by Andrew Ryback. When she returned on Morocco, she knew she only had to go clean but says Morocco is naturally fast. “I wasn’t planning on doing the harder inside turn with him but it just showed up,” said Goldman. Rocs to Riches finished fifth and is a Roc USA baby like Morocco. Competitors will now gear up for the $35,000 Prix de Lamplight, which takes place Saturday afternoon with VIP seating available. 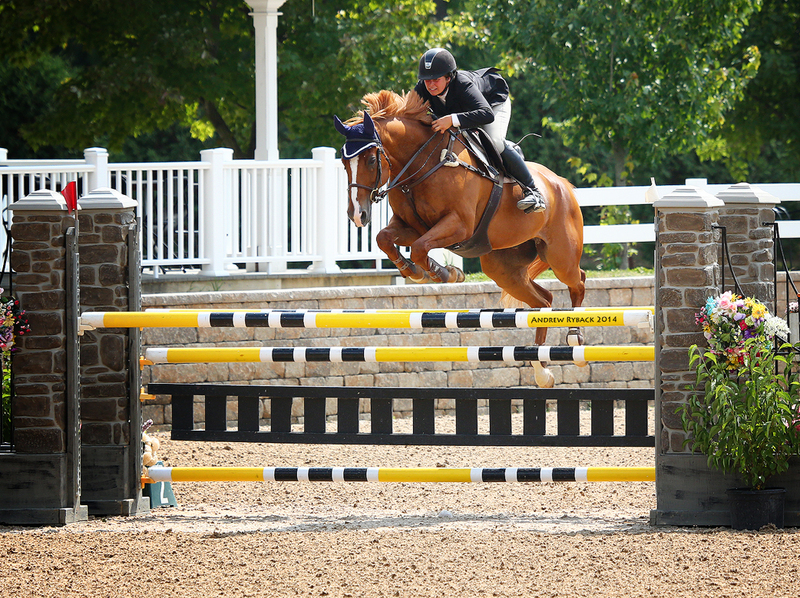 Equifest II continues through August 3rd and is managed by Allen Rheinheimer. The week features a $5,000 USHJA National Hunter Derby and the $15,000 USHJA International Hunter Derby along with a fantastic Derby Brunch. For more information on Lamplight Equestrian Center, contact Anna Margalef at 630-546-5576 or annam@lamplightec.com or visit the website atwww.lamplightequestriancenter.com. For more results visitwww.horseshowsonline.com.